Your home’s electrical system is an intricate part of your house and helps control and carry electricity through each room with a simple click of a switch. The electrical panel is the central part of the system and if it is not safe or functioning properly, it could be a danger. How do you know if your electrical system is safe? Outdated panels from the 1970s and before could be faulty and vulnerable to a house fire. #1: Know how old your electrical panel is. Outdated panels from the 1970s and before could be faulty and vulnerable to a house fire. If your home is on the older side and your electrical panel has not been replaced with something newer, you may need to have it looked at by a professional residential electrician to see if there needs to be updates made. #2: Know what kind of panel you have. There are several main types of electrical panels that have been deemed unsafe by electrical professionals. Federal Pacific (FPE) electrical panels are unsafe because their circuit breakers often fail and trip. Even when the circuits are on the off position, they can send power to the circuit, which could cause an electrocution if the homeowner is working on a circuit that is believed to be off. Zinsco panels are another type of panel that have been marked unsafe. These were popular in the 1970s and have circuit breakers inside that can melt the main bus bar. This means that the circuit breaker isn’t allowed to trip, even if it’s shorted or overloaded. So, if there is ever an issue like that, the power surge will melt wires and could cause a fire. #3: Upgrade your electrical panel. Nowadays, your panels have more stress than they used to because of the increasing amount of electrical devices that demand constant charging (smartphones, tablets, wearables, etc.). So, if you have a panel that is old and out of date, it’s important to get it checked out by a professional to see if it needs replacement. 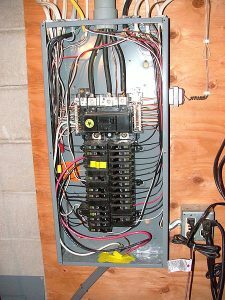 Our team of electricians at Prairie Electric are experienced in this area and can let you know if there are any outstanding issues with your panel that could cause it to be a fire hazard. Contact us today for more information on getting your electrical panel inspected or replaced.